Jack and Diana Brinkley grew up in Asheville, N.C. and first met in high school, where they were involved school ministry. Eleven years after high school graduation they were married. They now have two daughters, Bekah, and Anna. After high school, Diana went on to organize a campus ministry at Meredith College in Raleigh, NC and serve as a songleader for summer camps. Jack’s call to ministry began by attending a national Christian sports camp at age 14. Fast forward 12 years later to a national coaches’ camp, and Jack became a born again Christian. Four years later, he began sports ministry fulltime in Georgia. In 1988, Jack opened an area sports ministry office in Asheville, serving as the director. He also served as State Director from 1993-2000. Jack currently works in the Greater Asheville area and speaks frequently at various events. Coordinate small groups and leadership teams. Promote area rallies, outreaches, & sports clinics. Recruit athletes and coaches to summer camps, and mission trips. Develop adult volunteer involvement & boards. Raise financial support in the Asheville area. Bible teacher. Public Speaker. Team Chaplain. Jack Brinkley achieved his Post Graduate from the University of West Georgia (Masters in Education - August 1984), Carrollton, GA. Defensive Coordinator for 1982 National Champions. NCAA Division III, University of West Georgia. Champions, Division II, Valdosta State University. North Carolina, 1-1-1993 to 9-30-2000. Greater Asheville FCA Director, 8-08-02 to 7-22-04. Executive Director, Sports Outreach, 8-1-04 to Present. 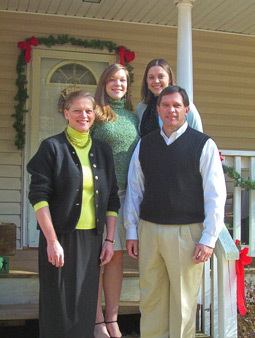 Jack Brinkley is pictured here with his family in his hometown of Asheville, NC.